Among the odd steamboats of the past may be noted the North Star. Inland Lloyds Vessel Register, 1893, lists the vessel as of 14 net tons; built Oconto, Wis. by Fowle in 1871. Port of hail, Ft. Howard. 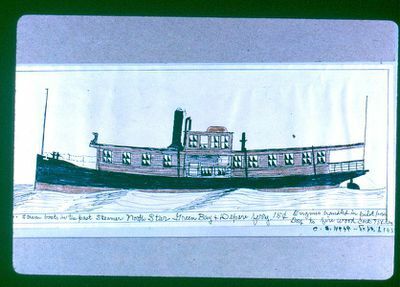 The North Star ran as a Green Bay to De Pere ferry -$.15 a ride; The engines were handled from the pilot house. A boy fired up the boiler at a cost of $.75 a day. Also listed as tug in Ship Masters' Assoc. Directory, 1903.